If you have missed the latest in big virtue signalling and social justice nonsense, go find the Gillette razors “Be the best a man can be” advertisement. This ad is directly insulting to men and basic masculinity. It tries to re-define basic masculinity into a weenie, a wuss, a pansy, a wimp, a limpwristed femi-man who doesn’t look at anyone unless spoken to and who doesn’t speak his mind without raising his hand first and asking permission. The ad is full of straw man depictions of stupid boorish behavior that any normal person would roll their eyes at, hardly representative of actual men, but it is also really super full of and targeted at behavior that is perfectly normal and healthy. Like two little boys wrestling on the grass at an outdoor BBQ. Yes, even little kids wrestling is considered bad by the wusses at Gillette. Even Gillette is now part of the war on boys and boyhood. I wrestled, from seventh grade into college. Wrestling is a great sport, because it gives a wholesome outlet to naturally masculine urges to fight, make war, and to win contests through strength. These are traits that humans acquired over 70,000 years of evolution. Anyone who thinks that these urges are dead everywhere except in bad old America is willfully blind to the terrifyingly brutal wars being fought all around the world. 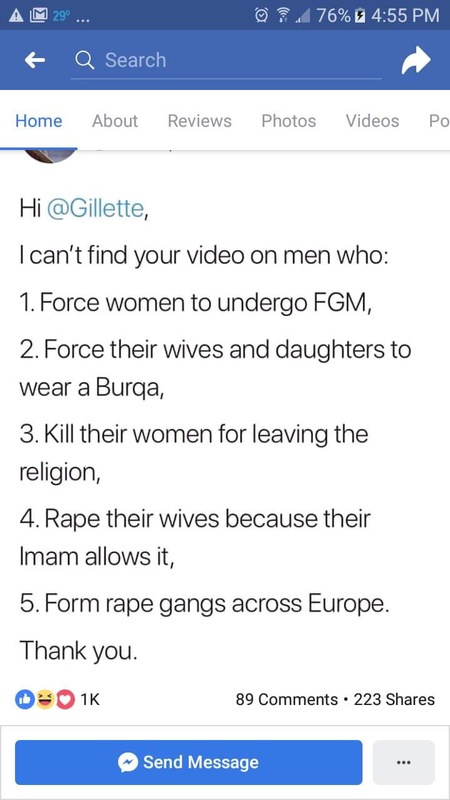 In case the people at Gillette haven’t noticed, America is actually a very safe and civilized place, but the onslaught of violent rapists from across our porous border is changing that. Little kittens play-wrestle, too, as do puppies. Are these natural and long-learned behaviors among cute little animals going to be targeted next for eradication? Teaching the recent descendants of fearsome wolves to makey-nicey amongst themselves may well be on Gillette’s to-do list, but it will probably be as unsuccessful as their attempt to dumb-down we humans. What is really at work here is toxic femininity, the sexist, destructive and unnatural political force unleashed by a small group of male-hating women and their weakling, feminized male enablers (who would not survive in a hunter-gatherer society for one minute, an indication of how innately unnatural they are). These people are trying to bully the rest of us — we successfully masculine males and our enabling blatantly heterosexual female mates — into adopting their pathetic approach to dying out quickly on Planet Earth. Toxic femininity is yet another politically correct assault on the basic pillars of human civilization, just one among the many we have witnessed in recent years. But don’t worry, friends, this silliness is falling flat on its face as we speak. But even if it were ultimately successful, the true knuckledraggers down the road would eventually come knocking, kill everyone in their way because by then everyone would be weak and pathetic, take whatever they want, and burn the rest on the way back home. Toxic femininity would be the very first victim, as it is inherently vulnerable, indefensible and undefended. So even if it wins here in Western society, it will ultimately fail. P.S. Gillette and Proctor and Gamble are now added to the ever increasing list of companies I will not buy from, like Ben and Jerry’s ice cream, Nike, and Levi’s. All these companies have made the carefully considered decision to attack me, demean me, mis-characterize me, and take policy positions contrary to those I hold. They are driving me away as a customer by their own choice. So I am exercising my right to choose what to buy, and I am choosing not to spend my money on their products. We shall see who wins that contest in the end.